So, I have finally finished knitting another top down cardigan. As I mentioned in an earlier post, I was not sure how this was going to turn out as I was designing it as I went along: I changed the sleeve cuffs and cardigan edges about 3 times from garter stitch to more rows of garter stitch to 1×1 rib. The only notion that I had before I began was that it would be fairly casual to wear over jeans………or even jeans shorts! I used Rowan’s All Seasons Cotton in the colour Denim and the darker stripes are in Storm. This yarn comes in 19 different shades including blues, greens, pinks and purples, a red, a yellow, an orange, neutrals and black and white…..a great selection to choose from! All Season’s Cotton is fairly easy to knit with and as it is aran weight it is also a relatively quick knit…..but of course this depends how many times you rip it back after changing your mind……..consequently, I found it very easy to rip back! It is a plied yarn which means it is made up of several threads twisted together however, some knitters find that these can split while knitting. If you find this happens to you, you could try using Rowan’s Softknit Cotton as this yarn is constructed like a very tiny i-cord so unlikely to split. Personally I didn’t have any splitting problems and I found All Seasons Cotton a delight to knit with. When knitted up, the stitches have great definition, as you can see from the lovely raglan line, so great for all types of stitches especially cable and textural stitches. 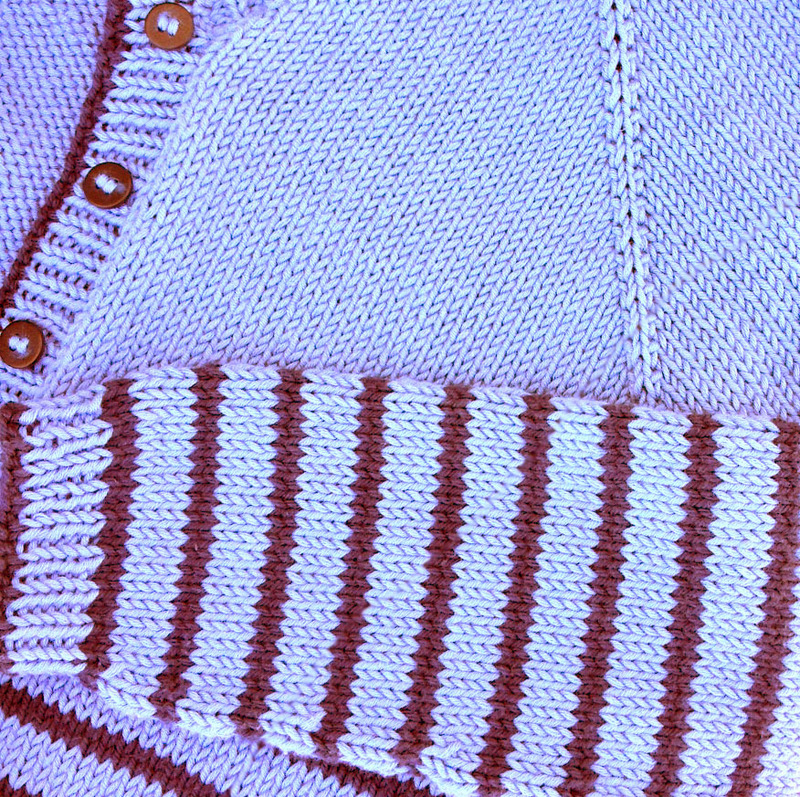 The finished cardigan is so lovely and soft and it has a very nice drape to it. The other quality that I noticed about the knitted material is no matter how much I squashed it in a heap in my knitting bag as it slowly grew larger and larger it never appeared to wrinkle! So this makes it a great yarn to use for a garment that you would use for travelling……..just like my cardigan! Now…………….where shall I go? If you would like to see more patterns using this yarn please click here, which will take you to Rowan’s All Seasons Cotton patterns. 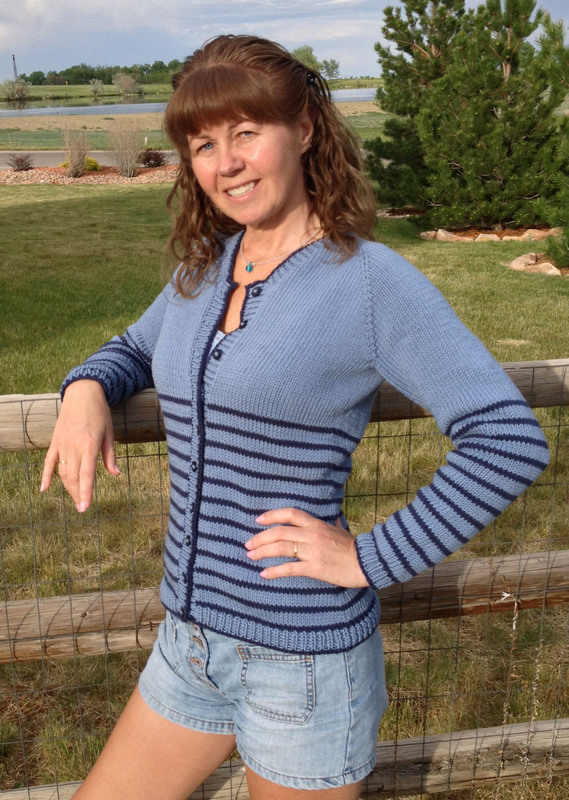 If you would like a copy of my Jeans Cardigan pattern (sizes 36″ and 38″, 91 (96.5) cm only) it is available for sale on Ravelry with all my other patterns. Join over 1200 other Woolly Subscribers for Information on New Designs, Yarns and Publications!